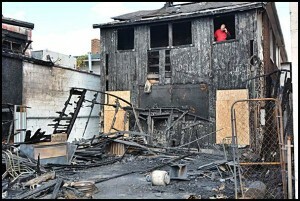 A man looks out a window at Hippo’s Bar on Conant to survey the damage caused in a fire last Sunday night. Blame a wire that broke off from an electric transformer in the alley behind Hippo’s bar for causing a fire to break out last Sunday night. That’s the unofficial word on the cause, said bar owner John Hypnarowicz. He said sparks from the loose wire hit the garage behind the bar. “That’s when it took off,” Hypnarowicz said about the resulting fire. The Fire Department said the cause is still undetermined. Fire Chief Paul Wilk said that the garage was old and the wood was dried out. “All of a sudden there was a lot of fire,” he said. The department had to call in four off-duty firefighters to help out. The fire destroyed the garage and the roof of the bar. The bar itself was spared from flames, but it suffered heavy water damage. Hippo’s is one of only a handful of neighborhood bars that remain in Hamtramck, which once boasted having a bar at the end of almost every block of the city. Although the name of the bar implies something huge, it was one of the smallest drinking establishments in town, rival only to Suzy’s bar for who’s the tiniest bar. The Conant bar has been operating under one name or another for about 50 years and before that as a shoe store, said Hypnarowicz. The name of the bar is actually a play off and the nickname of Hypnarowicz, who is one huge guy with a heart to match. He is a retired public school bus driver who has organized annual Christmas parties for his Special Ed kids he drove home for years. Hypnarowicz said he won’t know what will happen to the bar, as far as rebuilding, until he meets with his insurance company. In recent years he has been unsuccessful in selling the bar. “I didn’t want to go out this way,” Hypnarowicz said. The structure also has three apartments upstairs, which were empty and undergoing renovations, Hypnarowicz said. He and his wife Mary have owned the bar for 23 years. In recent years, the business became a victim of a changing neighborhood. An influx of Bangladeshi-Americans moved in as Polish-Americans moved out to the suburbs. Because most Bengalis are practicing Muslims, alcohol consumption is not allowed. Hippo’s has become a part of the national trove of cinema trivia. The name of the bar wound its way into the movie “Grosse Pointe Blank,” which was partially filmed on location in Grosse Pointe. A producer with the film saw the name of the bar and asked Hypnarowicz and his wife if he could use it for the fictitious “Hippo Club” in the movie. Both John and Mary flew out to California to see scenes of the movie being shot, and had lunch with its stars, John Cusack and Minnie Driver. Also damaged in the fire were Bengal Spices next door and a garage across the alley from Hippo’s. Damage to Bengal Spices was where live chickens were kept. Fire Chief Wilk said the chickens survived.